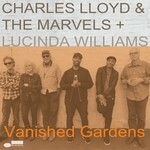 Vanished Gardens is a transcendent new album that presents the fascinating collaboration between NEA Jazz Master saxophonist and composer Charles Lloyd and acclaimed GRAMMY-winning singer and songwriter Lucinda Williams. Together they weave several threads of American music (Jazz, Blues, Americana, Country, and Rock) into a thrilling and uplifting new musical hybrid. "A friend had turned me on to Lucinda when Car Wheels On a Gravel Road came out," Lloyd recalls. "Lu has worked a lot with Bill Frisell and Greg Leisz, so a couple of years ago she came to one of my Marvels concerts at the Lobero Theater in Santa Barbara. It was our first meeting and I sensed a deep Southern crossroads connection. Not long after that meeting she invited me to guest at her UCLA concert and then I invited her to guest at one of my concerts about a year later… It was clear we had something we wanted to explore together." Williams is featured on five of the ten tracks on Vanished Gardens, including expansive new versions of her well-known songs "Dust," "Ventura" and "Unsuffer Me," as well as a full-hearted interpretation of Jimi Hendrix's "Angel" that closes the album. Alternating with the vocal tracks are five sublime instrumental offerings including three new Lloyd originals and versions of Thelonious Monk's "Monk's Mood" and the Roberta Flack popularised song "Ballad of The Sad Young Men." "I've worked with a lot of poets," Lloyd says, "especially during my Big Sur days; Lawrence Ferlinghetti, Charles Bukowski, Gary Snyder, Diane diPrima, Schyleen Qualls, Michael McClure, Bob Kaufman, James Dalessandro… putting words and music together. Lu is a poet. An authentic, American voice. Her sound is like an emotional barometer. A weather vane. Sometimes it swirls around in the tempest of a storm and sometimes it is sweet and pure as a Southern breeze carrying the intoxicating perfume of magnolia to you. As a poet, her imagery knocks me out. She is a reporter of the human condition, of life on planet Earth." "We know each other better now and therefore we can travel more freely down certain paths," says Lloyd, reflecting upon how The Marvels have evolved since their 2016 debut I Long To See You, which NPR called "music that evokes an uncommon state of grace." That album featured guest vocals from both Willie Nelson and Norah Jones, but the collaborative nature the band has nurtured with Williams has led them to even greater heights of expression. "Having Lucinda on five of the tracks adds a new dimension to the overall experience," says Lloyd, "for my listeners and for hers. I think on the new recording we were able to let go and plunge deeply into the sound." Lloyd celebrated his 80th birthday in March, and enters his ninth decade at a creative peak in what now stands as a mountainous and formidable career, continuing his lifelong artistic journey to explore the spiritual realms of wonder and beauty. The Marvels are Bill Frisell on guitar, Greg Leisz on pedal steel guitar and dobro, Reuben Rogers on bass, and Eric Harland on drums. Vanished Gardens was produced by Lloyd, Dorothy Darr, and Don Was.